Peugeot has introduced its ML6C 6 speed manual gearbox to all 2.2 litre HDi diesel engine versions of the 807. The gearbox will provide a number of benefits such as improved fuel consumption, more relaxed driving and a reduction in CO2 emissions. 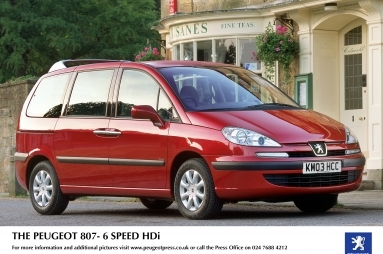 Sales of Peugeot’s 807 people carrier since its launch in January 2003 has exceeded all company expectations with a record 3,232 registrations. The introduction of the 6 speed gearbox and strong consumer offers, such as 0% finance over 4 years, can only maintain this momentum. The award of five-stars by Euro NCAP, the highest possible crash protection rating recognises the comprehensive active and passive safety systems of the 807. The standard fitment of Electronic Stability Program (ESP) on all HDi diesel models ensures 807 is a safe place for families when they’re on the move. 807 Executive and Executive SE 2.2 Hdi versions also now benefit from the fitment of 16" Largo alloy wheels as standard equipment, to replace the current 15" alloy wheels. The 6 speed manual gearbox fitted to the 807 is also fitted to Peugeot’s 607 executive saloon and will be fitted to the new 407 model to be launched in May 2004. The improved specification is available at the same price as the outgoing model, with prices for the 807 2.2 litre HDi 6 speed starting from £22,800 for the 2.2 litre HDi diesel GLX version, to £25,060 for the Executive SE 2.2 HDi.